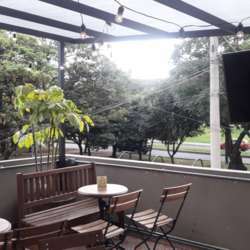 You must be a member of the Bogotá Potluck & Barbecue Group to attend this activity. Would you like to join this group? a) You either have the SV WE sort out, in which case kudos to you and just stop reading. b) You're gonna stuff your face with junk food and watch Netflix asking yourself when everything went off road. c) You are not sure yet, but you are going to rush into a relationship anyway due to FOMO / fear to loneliness. d) You met the love of your life the day before during the official event and can't wait to see that face again. If you are either b, c, or d, is a no-brainer: Just pack the junk food, empower yourself and join us for food sharing and beer drinking. *Bring any food cooked by yourself (preferably) or bought at a restaurant to share while drinking beer. At least 4 portions. Ideas: Bring a medium pizza between 2 people; nuts and cheeseses; crackers and dips; chicken tenders; etc. **Chips and drinks are not allowed into the pub and must be bought there. ***There is not a reservation, cover or any fee to join, but they will only save the tables for a short time before giving them away to other groups.